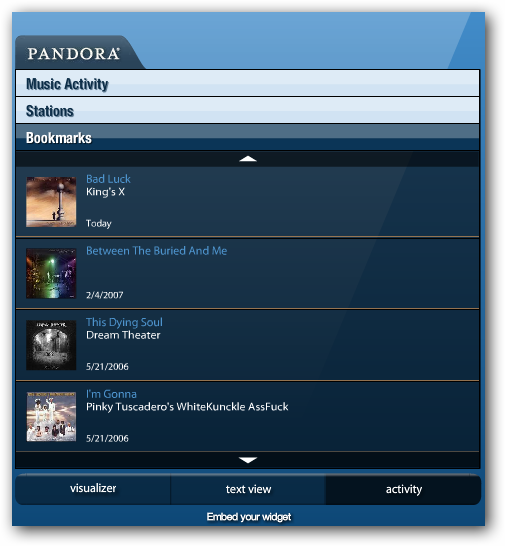 Pandora has long been a one of the coolest free streaming music services on the net. They now offer a premium account called Pandora One that has new features, no ads, and better music quality. To upgrade log into your current account and click on the Upgrade link. You will be brought to a secure page to enter your credit card information. The upgraded service is only $36 fore a full year of use but one thing you may want to uncheck is the Auto Renewal box before submitting the payment. After everything is approved you can begin using the upgraded service. After upgrading you will see the Pandora One tab at the top where you can access all of the new goodies such as new background skins for the player page. 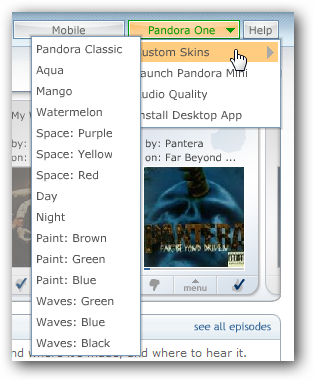 From this menu you can launch Pandora Mini which opens up in a separate browser window that you can resize. Another great new feature is upgrading the sound quality for the music. You can switch between 128 and 192kbps where you might want to use the normal 128 quality for slower or busy network connections say at the office. 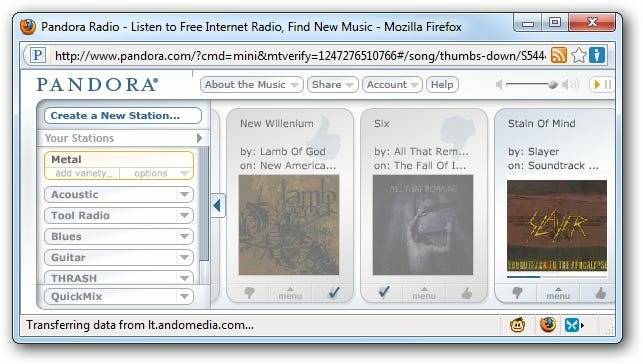 The coolest feature of Pandora One is the Desktop application built on Adobe Air. You can do an automatic install or manually by installing both files. A progress screen is displayed while installation takes place. The desktop application has a very slick easy to use interface. 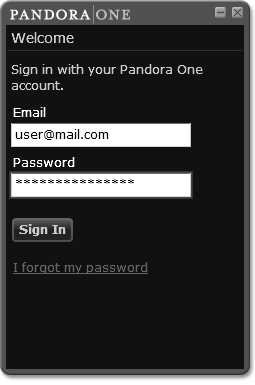 The first thing you will need to do is sign into your Pandora account. 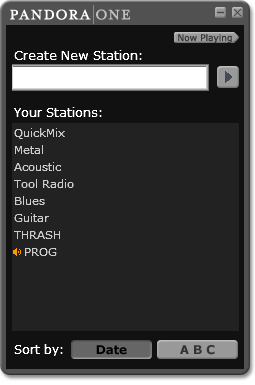 Next choose your favorite created station or make a new one. Notice you can sort them by date created or in alphabetical order. 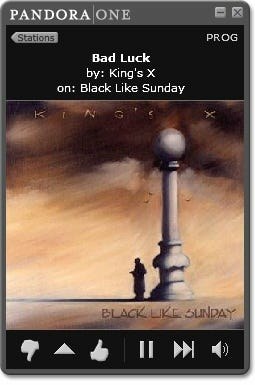 When a song is playing you get a nice display of the cover art. You can rate the song, pause or play, skip to the next song, and control the volume. Click on the pyramid icon to get additional menus that are familiar to Pandora users as they appear on the web player as well. 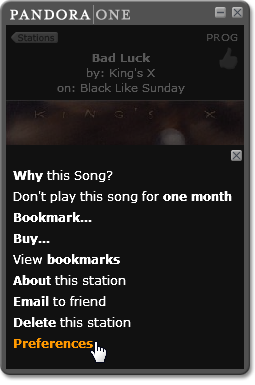 Bookmark songs while your listening to save them to your Pandora account widget that you can embed on your website or social sites like Facebook and Myspace. 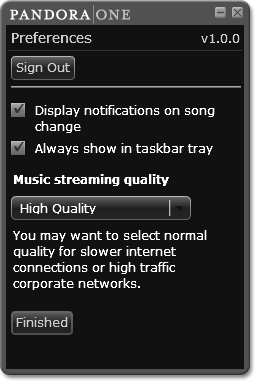 Most of these options will open up in a new browser but you control all then preferences through the player. A display pops up briefly showing the next song being played. This is definitely an improved service for music lovers. You can listen to unlimited amounts of quality streaming music from the Music Genome’s growing database of tens of thousands of songs and music genres. If you are a Pandora fan and want to upgrade your service Pandora One is definitely worth every cent. Editor’s Note: This is a review of a non-free service. This is not a sponsored review and we make no money from clicks or signups, we just happen to like this product. We believe in full disclosure and will not recommend something without having personally used the product.